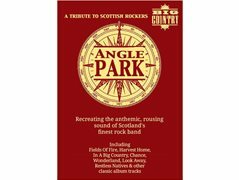 Angle Park - Belfast-based tribute to anthemic/celtic Scottish rockers 'Big Country' (In A Big Country, Fields Of Fire, Chance, Wonderland, Look Away, Restless Natives, The Crossing album etc) seek a new, dedicated & experienced bass player to join their line-up. Preferably aged 35-50. Ideally you'll be reasonably familiar with the style of the band's legendary former bass player Tony Butler (who has joined us on-stage for an encore!). We've been recognised & approved by the band themselves. We've played numerous gigs including a sold-out show on the Belfast Barge during summer 2018. For certain gigs we will also be incorporating a few other celtic rock orientated songs by the likes of Thin Lizzy & Gary Moore etc into the set. New gigs in pipeline for 2019 both North & South & also currently liaising with a couple of promoters. Also keen to get the band onto fake festival circuit in the UK as well as corporate events etc. Commitment essential, but we've no objection if you're already playing in another band now & then as we're involved in other things ourselves & we'll work round that, as long as you're available two or three times a month for rehearsals. Must have own transport. Auditions to take place as & when interested individuals reply. No ego's. No time-wasters. Commitment essential. Ideally you'll have a bit of stage prescence & be happy to move about on stage & not be rooted to the spot lol! Must have own transport.